The Soho area of London contains both the best and the worst aspects of the city. On the one hand you have an endless assortment of seedy peep show bars and video stores, but fortunately on the other you have some of the most fascinating streets and shops in the capital. And it’s a great place to people watch. Within Soho, one street encapsulates all the virtues and vices of the area, and that is Berwick Street. Soho is an area crudely bounded by Oxford Street to the north, Shaftesbury Avenue to the south, Regent Street to the West and Charing Cross Road to the east. 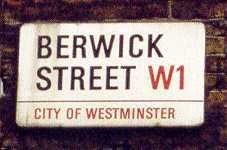 It is crossed by famous streets such as Wardour Street and Old Compton Street, but Berwick Street runs north-south right up the middle as this map shows. (Berwick Street is shown in yellow). As you can see from the map, the north end of Berwick Street meets Oxford Street half way between Oxford Circus and Tottenham Court Road underground (metro) stations. To get to Berwick Street from Piccadilly Circus underground station, follow the dotted red line – walk up Shaftesbury Avenue then turn left up Rupert Street. At the top of Rupert Street, just past the small market area, cross Brewer Street and walk along Walkers Court straight in front of you past Raymonde’s Revue Bar and you’ll emerge into Berwick Street. OK So Why Go There? In Berwick Street you can find a great street market that’s open every day (except Sundays), numerous record/CD shops, a vegetarian cafe, a pub, a busy fish and chip shop, and other interesting shops and restaurants. There’s even a supermarket where Soho residents do their weekly shopping. The street market is at the southern end of Berwick Street and is in my experience, the cheapest fresh market in London. 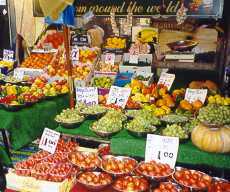 There are numerous fruit and vegetable stalls with really fresh produce, and whilst they all look similar, there are subtle differences between each one in price and what they stock. It may not be as exotic and adventurous as say Shepherd’s Bush Market, but you can get all the usual produce including beautiful plum tomatoes and avocados. Some of the stalls offer really good deals on fruit and vegetables – selling a scoop for £1 a time. There’s a fresh fish stall, a cheese stall, and a stall selling more types of olives than you could imagine. You’ll also find a specialist bread stall, a couple of stalls selling batteries and razor blades and a cheap CD stall. 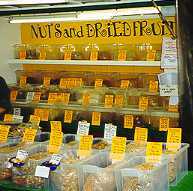 But my favourite is the stall selling nuts and dried fruit and other snacks – bombay mix, trail mix etc. If you’re sick of paying £15 for your CDs then you should head down to Berwick Street to save your hard-earned cash. For new CDs, the best shop is Mr CD – just north of the market. The guys here sell all full price CDs for just £10 each and although the supply of new release CDs in the actual week of release can be patchy, they have an extensive selection of recent releases and back catalogue titles. Don’t expect to be able to use your credit card for less than £20 though. Should Mr CD not have the one you’re looking for, try over the road at Selectadisc. Their prices are not quite as cheap as Mr CD, but still better than HMV, Tower etc. They have a good selection of new and back-catalogue titles, and they do sell some vinyl as well. Other shops selling new CDs/records include ‘Soho Music Company’ and ‘Daddy Kool’ sharing the same shop in the market area. The former has a limited selection of recent CDs at £10 and a lot of music posters and memorabilia. In the basement, ‘Daddy Kool’ specialises in Reggae and Roots music. Further up towards Oxford Street (at No 39) is XSF Records who stock Techno, Trance, Drum ‘n’ Bass etc etc. 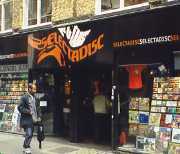 There are also a number of second-hand (used) music shops on Berwick Street: In the market area are Music & Video Exchange, and Sister Ray Records (at 94), and near Mr CD there are two branches of Reckless Records. These shops are very popular especially at lunchtimes and it’s possible to pick up some great bargains if you’ve got time to shuffle through all the inlays. Music & Video Exchange do videos and hi-fi too. Best value has got to be the Fish & Chip shop in the market area (No 20). The chips are excellent and sometimes the queue is well out into the street. But don’t be put off, the staff are really quick and you won’t have to wait long. Also in the market are there’s ‘Beatroot’ vegetarian restaurant at No 92 (see photo right). The food here is really tasty and it gets quite busy. You could also try the busy ‘King of Corsica’ pub next to ‘Beatroot’, or the two bistro-type places over the road – ‘Meditteranean’ and ‘Bar du Marche’. There are a couple of indian restaurants near the Oxford Street end. ‘Simply Sausages’ is at No 93 (ironically right next to the vegetarian restaurant) and sells an apparently infinite variety of sausages. At the top of the market on the corner with Broadwick Street is ‘Zest’. It has a huge display of arty greetings cards, alongside some exotic soaps, and a pharmacy. They also carry a few novelty gifts too including several lines of edible underwear. Up towards Oxford Street there are also a few jewellery shops. While not strictly in Berwick Street there are other really interesting shops close by. The ‘Vintage Magazine Shop’ in Brewer Street (at junction with Great Windmill Street) is a real treasure trove. It’s packed with film and TV related postcards, photos, posters, toys, mouse-mats, etc and you can waste hours here. 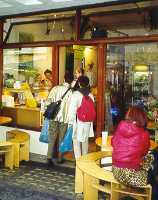 Just diagonally across Brewer Street towards Wardour Street is ‘Lina Stores’ which specialises in Italian food. They carry seemingly hundreds of different types of pasta, along with fresh bread sticks, cakes, cheese and olives, and a host of other delectables. ‘Cheapo Cheapo Records’ in Rupert Street has a huge selection of ‘cut-out’ and ‘deleted’ CDs, as well as piles of 2nd hand videos and vinyl. They’ve got so much stock it’s almost impossible to fit any customers in the shop. Finally, at 128 Wardour Street (just round the corner from the north end of Berwick Street market) is Crazy Salads – a favourite lunchtime destination. Select from an enormous selection to fill up your take-away container. 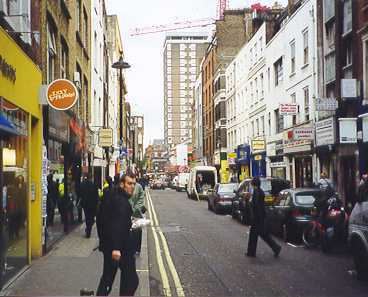 Berwick Street looking south towards the market. Go to this page to see larger photgraphs of Berwick Street and surrounds. None of the original links work any more so I’ve left them out but I’ll be adding some appropriate ones if I find them. Heard What’s the Story in a pub the other day – sounds as fresh as ever. Surely it was the best Oasis album. I have to say that I think ‘Definitely Maybe’ is better but ‘What’s the Story…’ is good in parts. Yes and the last one has some good tracks on it.